OK, say it with me: Oko-nomi-yaki. There you are. What is it? Well, the name derives from the words okonomi (“what you like”) and yaki (“grill”). So yes, this literally translates to “whatever you like, fried”! But don’t discard this dish as a tourist honeypot. 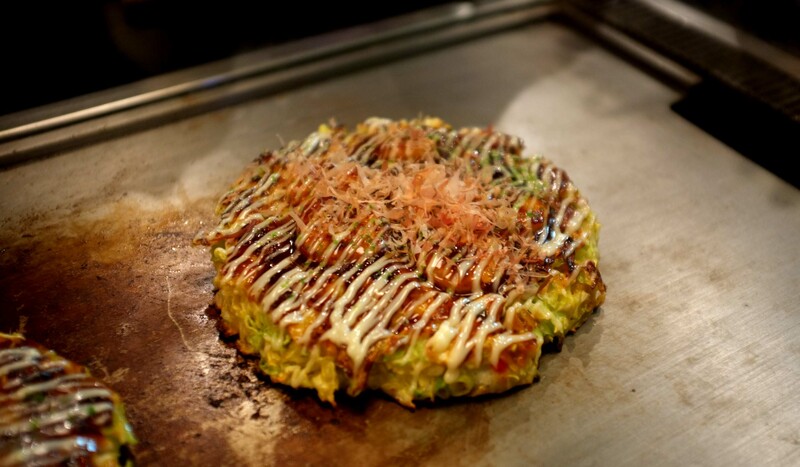 Okonomiyaki has its origins in the 16th century, and experienced a resurgence in popularity with survivors of the 1923 Great Kanto earthquake and the Second World War. A simple dish to make with the limited ingredients that were available in a recovering Japan; it proved a great snack for children. Today, okonomiyaki has taken on a life of its own. If you have to hand an egg-based batter and some sliced cabbage, you already have the essentials. Beyond that, the choice is entirely yours. Popular additions include thinly-sliced pork (*cough* not bacon! *cough*), grated cheese, kimchi, sweetcorn and even octopus. What you see above is the Hiroshima-style dish from the fantastic Okonomimura restaurant, which is unique in that the ingredients are layered up rather than mixed. Some claim this makes it a “Japanese Pizza”, but I’ll let you be the judge of that. You’ll have the most fun with this dish seeing it cooked in front of you on a massive hotplate, or teppan. Now that you’ve watched the pros, it’s time to pluck up the courage to have a go at cooking it yourself in one of many ‘grill-it-yourself’ restaurants! I had my own okonomiyaki initiation at Hyotan in Tokyo, where I was educated by the very welcoming staff in the more typical Kansai-style method of preparing this dish. The thin pork slices were cut up and then mixed together with the other ingredients, before being poured on the hotplate table and moulded into an omelette-like disk. At this point I put the camera away and got stuck in, making sure I gave the mix a good five minutes on each side. The dark brown appearance comes from spreading on a thick okonomiyaki sauce, which has a taste somewhere between Hoisin and Worcestershire sauce. The finishing touches included a drizzle of (Japanese) mayonnaise and a spoonful of Aonori (seaweed) flakes and Katsuobushi (dried, fermented and smoked tuna flakes). So you have the ready-to-eat okonomiyaki on a searing hot table. Now what? Time to bring out the spatulas! Typically, holding one spatula in each hand, you slice up the okonomiyaki into bite size chunks, which you then eat from your plate with chopsticks. Casting a glance at neighbouring tables however, I noticed that some diners preferred to thinly spread the mixture over the hotplate and simply scrape off portions as it cooked. For a dish which – like the Mark I Mini car – started life as a cheap and robust way to keep the population going in difficult times, okonomiyaki has blossomed into a culinary experience that combines sights, smells and flavours in surprising ways. But there is one more thing! Still got a sweet tooth that needs satisfying? Head out to one of many shops in Japan selling the softest soft-serve ice cream you’ve every tried. Cremia has become one of the top ‘softcream’ choices in Japan, a country known for its culinary expertise but less known for its love of ice cream. The Cremia posters highlight all the features of its signature soft-serve in a cone, the same way you would advertise a revolutionary new gadget. A bit over the top you might say. Then again, Cremia’s unbelievable texture alone earns them that liberty. ← Remarkable Japan – #02 – How Often Did You Bang Your Head in There?